Our staff of engineers regularly provides consulting services to Acequias for projects ranging from reconnaissance-level engineering investigations to assessment, engineering design, and construction management of diversion and distribution system rehabilitation projects. We have designed and supervised construction of over twenty-five Acequia rehabilitation projects in New Mexico since 1997. 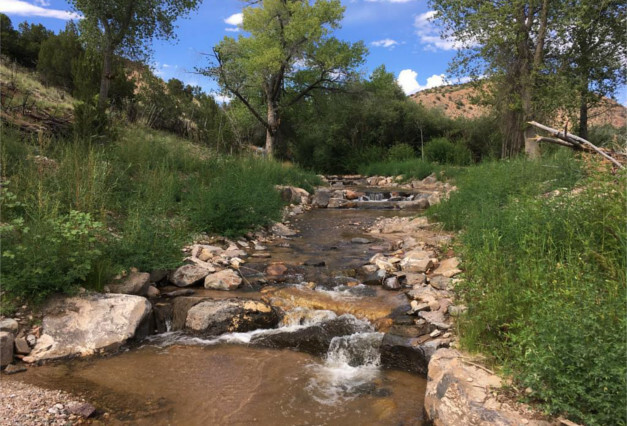 We are currently an on-call Engineering services contractor with the New Mexico Interstate Stream Commission’s Acequia Program and have been since 2000. Our staff of engineers has experience performing assessments of fluvial geomorphological processes on arroyos and rivers in the southwest United States. Our assessments include detailed measurements of the existing dimension, pattern and profile of an arroyo or river, as needed to identify the Rosgen River Classification Type and evaluate the existing stability of the stream channel. Our engineering staff is well-equipped to prepare site-specific arroyo stabilization or river restoration plans based on natural channel design principles. Our engineering staff is well-equipped to prepare site-specific arroyo stabilization or river restoration plans based on natural channel design principles. Our staff can also assist with obtaining necessary authorizations from the US Army Corps of Engineers under Section 401/404 of the Clean Water Act, and navigating any applicable state and federal floodplain regulation requirements. We perform embankment dam inspections, small dam rehabilitation design, and construction supervision services for maintaining compliance with rules and regulations of the New Mexico Office of the State Engineer Dam Safety Bureau. Our staff of engineers performs hydrographic data collection and mapping of river channel conditions for sedimentation monitoring, floodplain modeling, and assessment of fluvial geomorphologic conditions. Our staff of engineers is experienced in providing complete hydrologic and hydraulic modeling services. We use publicly available software (eg., HEC-HMS and HEC-RAS) to perform analyses of existing watershed hydrology, probable maximum flood, simulation of flood flow water surface profiles, and mapping of simulated floodplain extents. Our staff of engineers is skilled in assisting clients with their ground water and surface water administration needs. Some typical services we provide includes assistance with filing applications for permits to appropriate surface or ground water, changes in point of diversion or place of use, and proof of beneficial use applications.